I was planning to do another post in my water quality series, but I am not feeling it tonight. 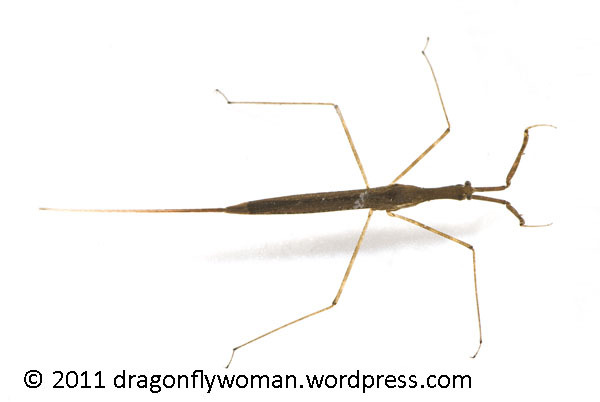 Instead, I am going to discuss my favorite insect, Ranatra quadridentata. You don’t mind, right? We’ll get back to the water quality stuff next week. 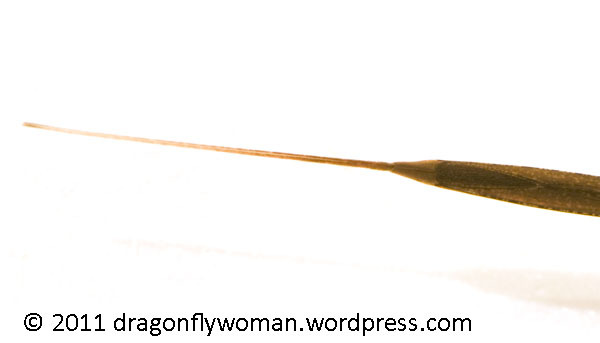 I got excited about the possibility of pursuing entomology as a career because of dragonflies. I adore dragonflies and love everything about them. They were my favorite insects for a long time. But then I went out collecting with a friend a semester or two after I moved to Arizona. We were looking for giant water bugs for my research and mucking about in a stream. Our strainers flashed through the little pools that had formed in the streambed during the dry season and came up full of treasures. 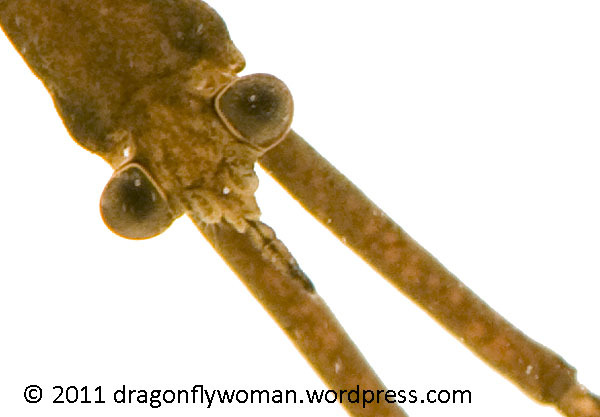 I hadn’t taught my first aquatic entomology course yet, so I didn’t yet know most of what I was looking at. At one point, I was shifting the leaves, sticks, and other non-insect junk around in my strainer and pulled a stick out. I was just about to toss it back into the pool when it moved unexpectedly! I may have been a wee bit startled. I jumped badly and the contents of my strainer ended up in my lap, the “stick” back in the water. I scooped it back out and took a closer look. My first Ranatra quadridentata! 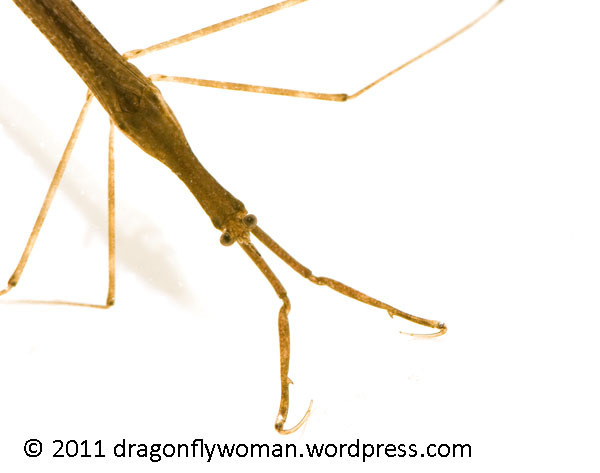 From this improbable beginning, my love affair with the water scorpions began. Water scorpions belong to the true bug family Nepidae, which is very closely related to the giant water bugs in the family Belostomatidae. Although the species in the genus Ranatra are long and narrow (they are commonly called water sticks), those in other genera, such as the genus Nepa, look a lot like the larger giant water bugs in the genus Lethocerus. It’s easy to see how closely related they are just by looking at them. They are both predators, both large aquatic insects, and they both have respiratory tubes that extend off the back end of the bugs. The easiest way to tell the two families apart is by looking at the respiratory siphon: giant water bugs can retract theirs into their bodies while the water scorpions cannot. Some of the water scorpions are big, impressive bugs. But I don’t love those. In fact, I haven’t ever seen a live one. No, I love the water sticks, the little skinny guys. They’re all over Arizona and I’ve seen thousands, maybe millions. They are one of those special aquatic insects that have a pollution tolerance value of 11, right off the top of the chart, so they can live in some of the most disgusting water you can imagine. They can be incredibly abundant in those kinds of waters because they are able to outcompete nearly everything else that might try to live in there. At one pond we take our aquatic entomology students to, you might get a hundred water sticks every time you swish your strainer through the water. Dropping a stick or a rock into the pond results in hundreds or thousands of water scorpions boiling up to the surface. It’s impressive! (Wish I had a photo of it…) The bugs also play dead when you pick them up. They really look like sticks. Just look at all the flailing! And how slowly they move! It looks more like they flounder about and hope they end up where they want to go rather than actually swimming. Worst. Swimmers. Ever! I have a fond memory of my former boss getting bit on the hand by a Ranatra. He swore up a storm! I had to let you know I received my gift from your contest today!!! I am so happy! The prints are absolutely beautiful ~ I can’t wait to get new paint on the walls & hang them up. They are a great incentive to get all the repainting & stuff done this summer. As soon as I get them matted, framed & up I will send you pictures! Again, Thank you soooo much! Yea! I’m so happy that you like them. I look forward to seeing them in your fabulous new space! Sure! My favorite field guide for insects that live on land is the Kaufman Field Guide to Insects of North America (http://www.amazon.com/Kaufman-Field-Insects-America-Guides/dp/0618153101/ref=sr_1_1?ie=UTF8&qid=1305611301&sr=8-1). It’s written by a guy I know (Eric Eaton) and he really knows his stuff! It’s where I go when I want to look something up quickly and I think it’s the best field guide. For the things in the lake, I recommend A Guide to Common Freshwater Invertebrates of North America by J. Reese Voshell Jr. It will only get you down to family, but the illustrations are quite good. And, if you happen to get photos of anything you see, you can submit them to BugGuide.net and have them IDed. It’s an awesome, awesome website that’s run entirely by volunteers who love insects. They’ve also got pictures of tons and tons of species that you can browse, though it helps if you can at least narrow it down to a family before you try doing it. As for what the insects in your lake say about the water quality… That’s a little more complex because you really need to ID things down to at least genus to get an accurate idea based on the insects. 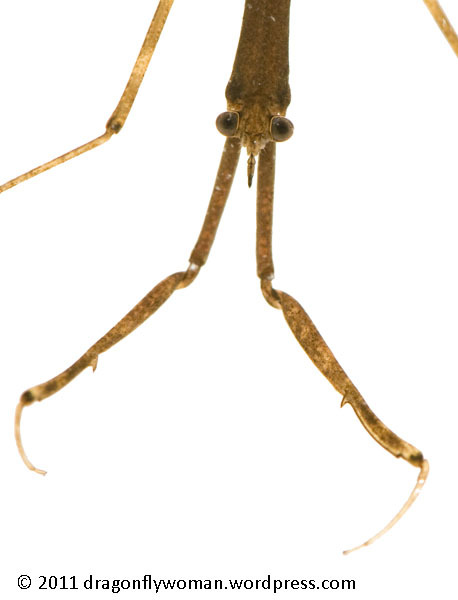 For the most part, however, the EPT species are the best indicators of good water quality (Ephemeroptera/Plecoptera/Trichoptera or the mayflies/stoneflies/caddisflies). There are mayflies and caddisflies that live in lakes, but you probably won’t find stoneflies there because they are flowing water insects. Dragonflies aren’t a really great indicator, but if there are several different kinds of nymphs living in the water then the water’s probably pretty good. A high diversity of species is usually a good sign whereas having only one or two very dominant species is often a bad sign. What’s really bad is seeing lots of fly larvae. If you get a lot of flies and little of anything else, then you’ve got some problems with the water quality. Another thing that can say a lot about a lake’s water quality is the amount of vegetation and algae supported by the lake. If there are lots of plants growing in the water (not just along the shores, but out further into the lake), that’s usually a sign that there are a whole lot of nutrients in the lake, i.e. organic pollution from fertilizers and other sources. If the water is green or yellowish during the summer, you are getting algae blooms and they’re usually caused by nutrient rich water as well. The whole water quality issue is very complex and is a little hard to characterize without some serious water and invertebrate sampling, but these are some general trends. Hope that helps!